I don’t really appreciate the way I learned the Beatitudes. I’m in my late forties now and I think I’m only starting to understand what’s happening in this passage at the beginning of The Sermon on the Mount, courtesy of a fantastic sermon and sweet, wonderful context. But the people listed here didn’t sound very happy to me. More than that, knowing these words came from Jesus, it sounded as if The Lord was commanding his followers to be downcast mourners and peacemakers, meekly persecuted. One of those examples of upside-down living in the Kingdom of God that we know were part of Christ’s teaching. I don’t think that’s what this text is showing, though. Think about where this passage appears. These are the FIRST WORDS of The Sermon on the Mount. The very beginning. The first thing Jesus has to say after he “saw the crowds” from Galilee, the Decapolis, Jerusalem, Judea and the region across the Jordan referenced at the end of Chapter 4. He’d been teaching and healing and proclaiming the good news, and many are gathering. And what kind of people are in this crowd? I think we know. We know because this is the Introduction to the largest uninterrupted session of teaching we have recorded from Jesus. And in an introduction, it’s common to address your audience directly. What a strange way to start a sermon. Unless it’s actually the most beautiful way to speak to someone there could possibly be. And Jesus continues his way around the crowd, next finding those who are mourning. His heart breaks for them, too. Maybe then he sees someone meek shyly lurking near the edge. He knows some are there because they have a deep and wounded sense of justice, longing for truth and righteousness. He finds some rich in mercy who may be downtrodden or taken advantage of in life. He sees the pure and the peacemakers, and knows the loneliness these types can experience, but tells them they will see God and be called children – part of his family. And finally, the persecuted, the cast-out, the misfits, who dare to seek him out anyway. He sees and addresses them all, all these types who are drawn to want to know God. HE SEES THEM. He sees you. Before Jesus has anything else to say, he sees you. And what’s more, he knows what you’re going through. He knows that whether you are pure in heart or poor in spirit, that very condition has brought you to him in a way thirsting for self or needing nothing could never do. And he wants you to know: not only do I see you, not only has your character or your current life situation brought you to me, but I have a nugget for each and every one of you, a warm blanket to your chill, a silver lining to your cloud. You, poor in spirit, you feel ill at ease in this world. Jesus sees you, and wants you to know, yours is the Kingdom of Heaven. A time is coming when you’ll know peace and a deep, rich purpose. There is reason to hold fast in faith. You, mourner, you feel abandoned and lost. But Jesus sees you and wants you to know: lean into those who will pamper you, cry with you, feed you and comfort you. That’s a good, good feeling, and one you’ll certainly be able to reciprocate to others in turn. You, feeling meek, mild, powerless. Jesus sees you. He knows things aren’t easy, but he wants you to know you have an inheritance! The meek in the world are given nothing. Jesus says he plans to give them everything. Talk about a silver lining. You, the merciful, Jesus sees you. He knows your forgiving heart, and he knows maybe this causes you to feel walked over at times. He also knows you will be shown mercy for having treated others as you would want to be treated. It goes on and on like that through the list. Before Jesus teaches anything, he lets you know he sees you there ready to learn from him, that he appreciates how this very thing has brought you to him, and that there is a wee bit of good news on the flip side of your coin. What a difference! This is far less a command for how to be, and much more a recognition and empowerment of how those who come to Christ already are. 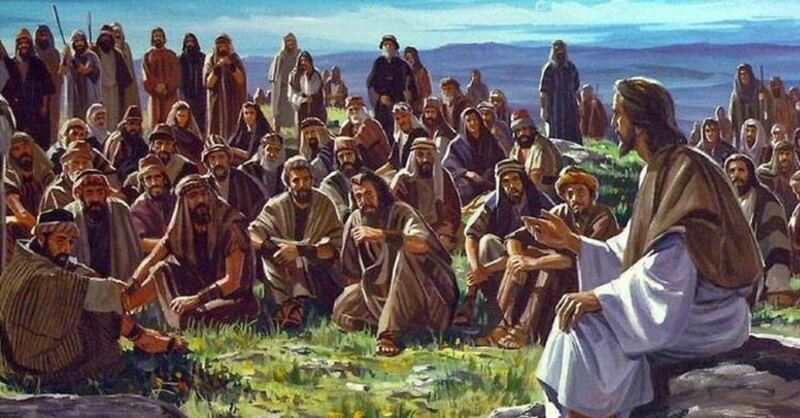 Take a rest on this hillside now and go through The Beatitudes again calmly, quietly, with wisdom and insight, considering what it was that first brought you to the feet of Jesus. And how that very condition has caused you to be called blessed. P.S. Go ahead, peek at the next thing Jesus has to say. After he sees you just as you are and gives you the upshot of your situation, he wants you to take it all right back to the world. You and your situation are needed. You and your situation give life flavor, and give light in the darkness. People will relate to you. They will see you living for the hope of your silver-lining promise right in the middle of the difficulties. Salt and Light - how flavorless and dim our lot would be without YOU! Shawn McEvoy is Director of Editorial at the Salem Web Network.